"...The end product was a well-balanced and designed forest garden, which I would have never had achieved on my own....Lincoln’s knowledge goes beyond books; he has actual hands-on experience, is easy to work with, delivers on-time and produces a quality product. I would highly recommend him for anyone that is considering developing an approach to garden/orchard agriculture that is much more sustainable than conventional methods." -Stan K.
Click here for services and billing rates. The City of Hyattsville, Maryland will soon plant the city's first two public food forests following the passage of the HEAL Resolution (Healthy Eating, Active Living) which calls food forests among a suite of health programs. Emerson Street Food Forest provides a critical green link in a Hyattsville neighborhood. The neighbors have expressed big enthusiasm about this new asset in their community. The McClanahan Food Forest, coming spring 2019, exemplifies Hyattsville Mayor Hollingsworth's vision for Community Living Rooms, while providing tasty treats for community members, and people heading for the nearby metrorail station. A family with a property high on a ridge in Shenandoah wanted a forest garden with plenty of room for medicinal herbs and fruit. The design for this steep site emphasizes holding and building soil with retaining logs throughout. A couple with beautifully renovated home on a corner lot in DC wanted a landscape that was abundant, and inviting for the neighborhood kids to come graze on fruits and berries. A high energy couple are transforming their blank front yard into a place of bounty featuring a new outdoor living room. They’re creative cooks and want the chance to share new native ingredients when entertaining their friends. 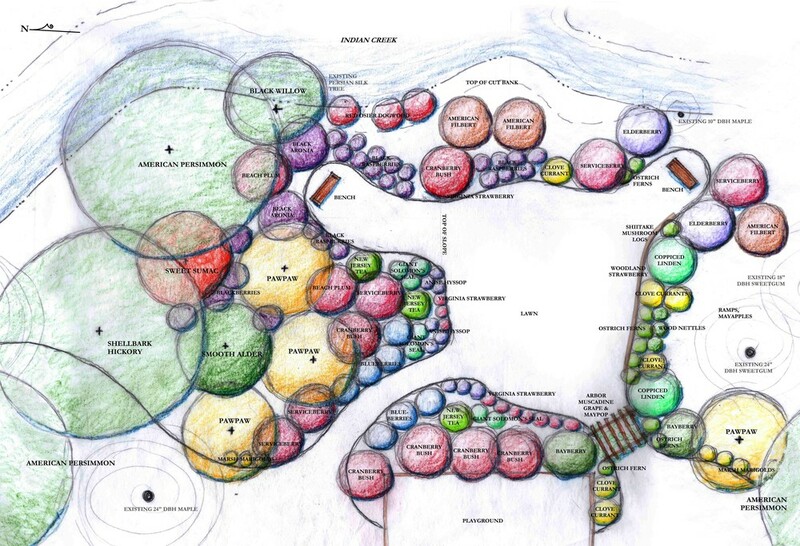 A gung-ho couple in Baltimore with lots of pizzaz wanted a rain garden of food and medicine. I specced the plants and they made it happen! The College Park, Maryland Committee for a Better Environment planted a public edible forest garden along the bicycle "Trolley Trail" for residents and trail travellers. Forested designed this project, presented it to government and civic organizations, and helped coordinate volunteers to plant it. 3 acres of dense young woodland with lots of invasive Buckthorn was carefully opened up to create this new forest garden. It features several varieties of apple and pear, unusual fruits, cane fruits for preserves, and room for lots of annual veggies. 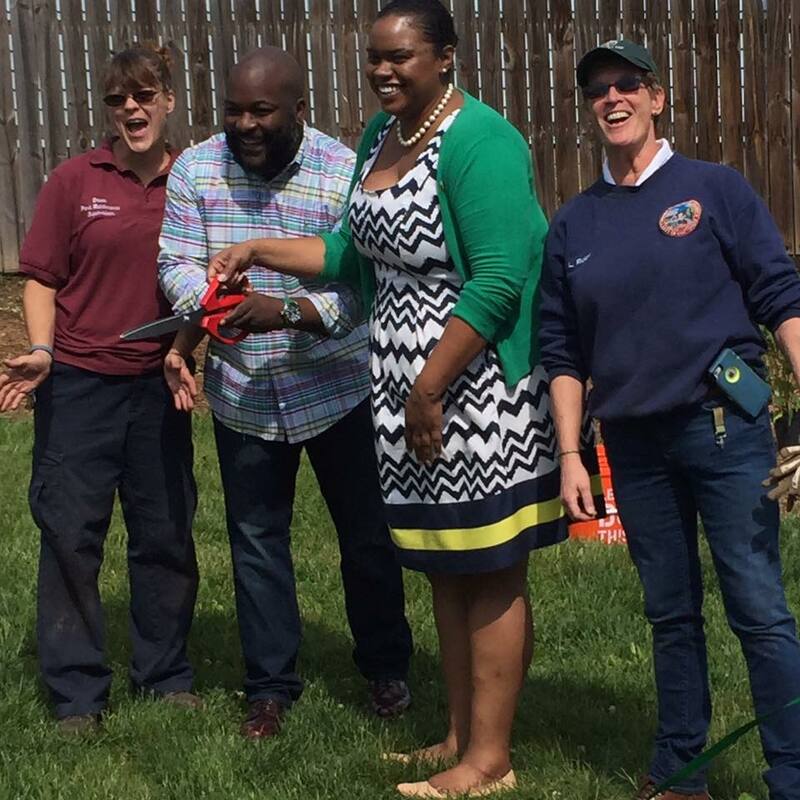 CHEARS, a Greenbelt, MD nonprofit, established a new food forest in a neighborhood park. This food forest will provide local kids fresh food from native plants for years to come. Owned by dedicated bird watchers and tucked into a swath of forested parkland, this Maryland forest garden emphasizes plants useful to both wildlife and people.